Onychocryptosis, more commonly known as an ingrown toenail is a common problem amongst people who wear poor fitting shoes that squeeze the toes together, women who wear high heels, people who cut their nails incorrectly and cut too close to the skin, people with a genetic predisposition and people who have injured their nail in some manner. Men are more likely to suffer with this complaint than women and it is particularly a problem amongst adults in their 30s and 20s. It is uncommon in children. Before deciding what to do for an ingrown toenail, you need to judge at what stage the problem is at. At first, the problem is painful, there may be inflammation, some reddening at the end of the toe and the nail cuts into the skin of the toe. In more serious cases, an infection may occur and there may be fluid, an abscess, for a few they even develop a fever and extra tissue may have grown. In rare cases an infection of the bone can occur called osteomyelitis. When wondering what to do for an ingrown toenail, weighing home treatment or medical treatment there are some things you need to be aware of. You should see a doctor if; there is infection i.e. drainage, fever, pain is worse, inflammation, lighter skin surrounded by red skin. If after 3 days of trying to care for it at home, there has been no improvement. If you have not had tetanus shot in the last 5 years? If you are diabetic, have poor circulation, are HIV positive or have AIDS, are undergoing chemotherapy or have any other reason why a wound would be slower to heal or makes you more at risk of infection. Most of the time a doctor can deal with an ingrown toenail there at the office. If you are diabetic and cannot reach your doctor visit the emergency room of your local hospital for treatment. Do not try and perform a surgery at home, in nearly all cases this makes the matter worse, or the ingrown toenail returns even worse. Only treat at home if there is no sign of infection. 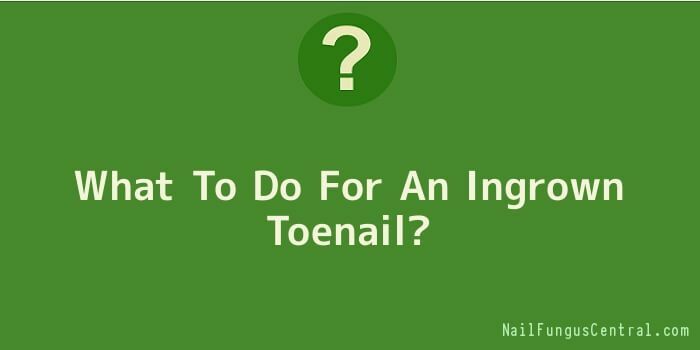 Here is what to do for an ingrown toenail at home. 1. Soak the foot for ten minutes a time at least 2 or 3 times a day. You can use just warm water or you can add Epsom salts, white vinegar (1 part to 4 parts water), Clorox beach foot bath (1/3 teaspoon in a medium bucket of water). 2. Try to keep the leg and foot elevated above heart level as much as possible. 3. Use a small piece of cotton or dental floss and slip it under the nail to help lift it off the skin. This is painful. 4. Make sure you cut toenails correctly, straight across, do not dig around and keep the nail longer than the flesh of the toe. Do not curve it at the edges. 5. Avoid tight shoes, high heels and try to keep your foot dry at all times.